Need a quick dinner? 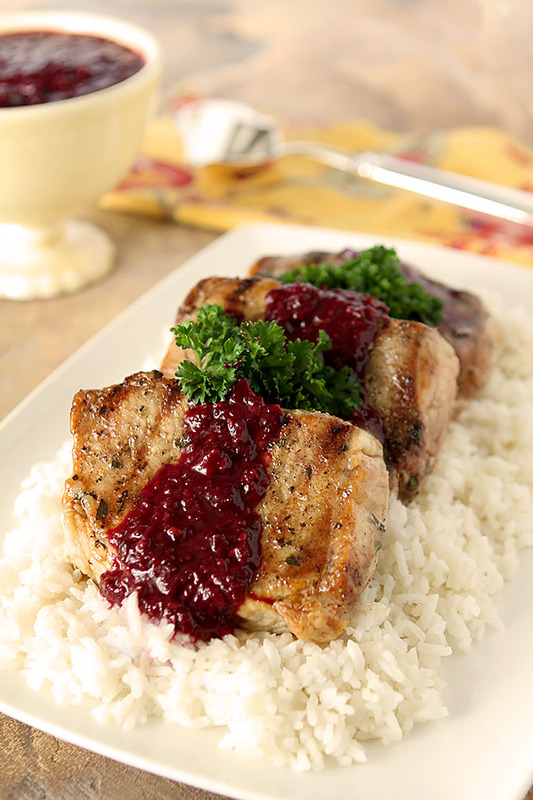 Make these Grilled Pork Chops with Blackberry Serrano Sauce. Easy and delicious! I bought a new grill last year, treating myself to a Weber Grill. I’ve run the gamut from a tiny CharBroil grill to a monster I had when I moved here that was too big for my little patio. I must admit the Weber is perfect; so well made and the Gray Steel Color actually was a consideration when I was painting my outdoor table and chairs. I missed it during deck construction though and I am so glad to have it back. I grill all year round and having it on my deck will make that even easier. It might not seem like much, but before I had to cart everything outside and down a couple of steps to get to it. No biggie…for most people. But I broke my knee 6 years ago and every step down and back up again is a biggie…so this is pure heaven. 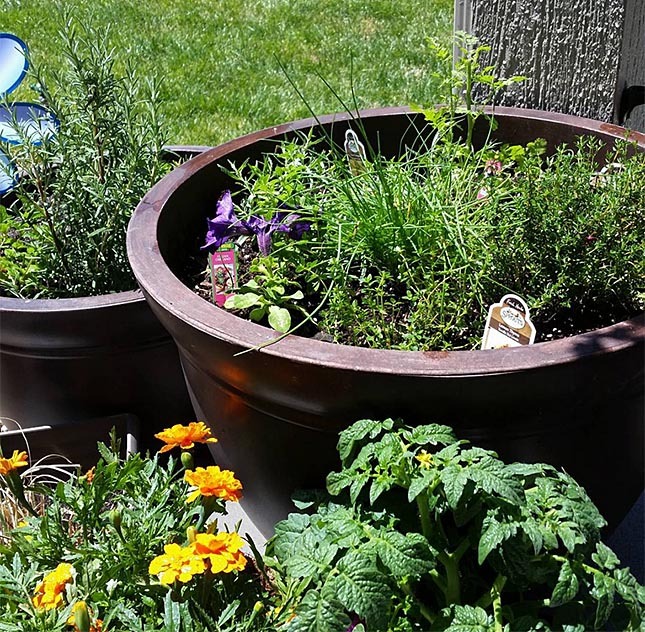 My big pots of herbs are on the deck too; now it’s a quick trip outside with some snippers and I can grab a combination of fresh herbs for marinades, salads and more. Today it was parsley and cilantro. I simply chop them and pat them on olive oil coated meat; whether it be chicken, pork or beef; add some salt and pepper and I’m ready to grill! I love pork with fruit; like chicken it’s compatible with a wide variety of fruits even if I especially love it with peaches and blackberries. I normally serve this dish with a dollop of a local jam product that is made with blackberries and serrano pepper but I thought it silly to list the jam as an ingredient that you might not be able to locate so I just pulled together the ingredients to make these Grilled Pork Chops with Blackberry Serrano Sauce. Easy and so good. The tender pork is lightly seasoned with herbs before being grilled and then topped with a sauce made with sauteed onion and serrano peppers mixed with with blackberries, honey and balsamic vinegar before serving. The sauce was so good that leftovers were being dabbed on bread…no one wanted to leave even a smidge on their plate! Rub vegetable oil over grill grates and preheat grill to high. Rub the pork chops with the olive oil and then sprinkle with the herbs and pat them all over. Sprinkle with salt and pepper and let sit for 10 minutes. Lower heat to medium heat and grill chops 5-7 minutes per side until the internal temp is 140 degrees. Remove from heat to a platter and cover; residual cooking should see the internal temp get to 145 degrees which is perfect for pork. Saute the red onion and serrano pepper in 2 Tbsp of olive oil until the onion is translucent. Add the remaining ingredients and simmer on low for 10-12 minutes until the blackberries have broken down; cook longer if necessary. Using a blender or stick blender, pulse the sauce briefly to blend ingredients. I like mine to be a bit chunky but it's personal preference. Remove from heat and let cool slightly. 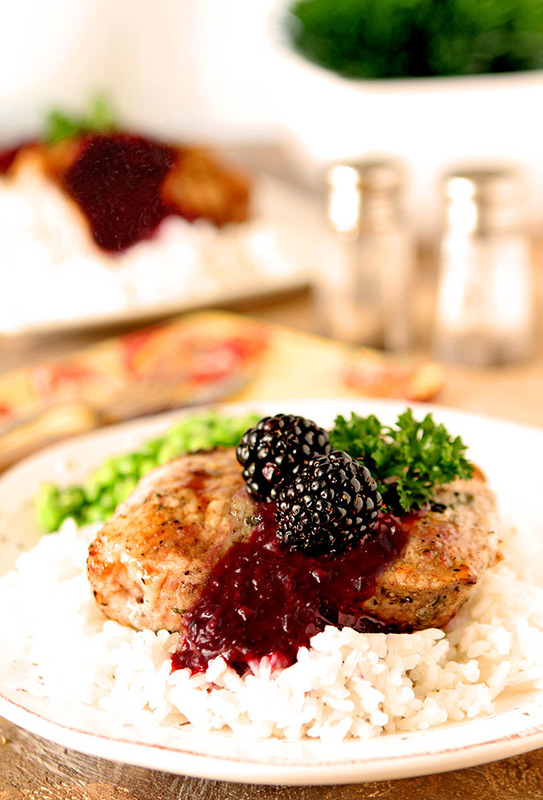 Serve the chops over rice with the sauce on top; garnish with additional parsley and blackberries if desired. I’m always looking for new recipes for dinner and this is one I’m going to be making. We LOVE our pork chops and I generally make it the same way almost every time. It’s good to mix it up a bit. I just know that I will LOVE it!